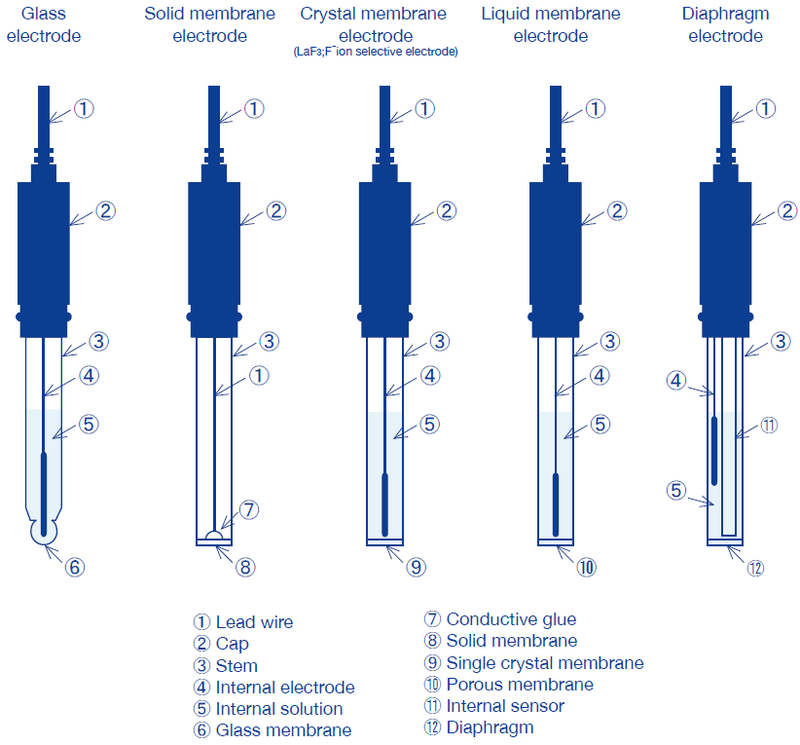 Ion selective electrodes are categorized into the five types shown below, depending on response membrane. Electrodes have a different internal resistance depending on their response membrane, and also require different measurement methods, electrode storage, and electrode maintenance. Please read the precautions attached to each electrode carefully. Response membrane consists of a glass thin membrane. Response membrane is composed of a single crystal of—or pressure-molded powder consisting primarily of— poorly-soluble metallic salt. F- electrodes have a response membrane composed of a single crystal of lanthanum fluoride LaF3, and have a neutral internal solution containing F- ions. Electrode has a response membrane which consists of a porous membrane or macromolecular material that acts as a support for polar organic solvent containing dissolved liquid ionic-exchanger. Also known as a plastic solidification membrane electrode. Electrode is composed of a stem into which an internal pH glass and reference electrode have been inserted, and is filled internally with liquid and coated with a diaphragm.